latest styling fad--a wraparound windshield. Officials at Studebaker Canada Limited had wanted to return to the assembly of cars in this country when the 1939 Champion turned out to be so highly popular with consumers. World War Two intervened in September of that year and the company had to wait until the end of the global conflict to re-establish its domestic assembly goals. The company arranged the purchase of a 320,000-square foot munitions factory from the War Assets Commission in Hamilton, Ontario on March 21, 1946. The 1939 Studebaker Champion was designed by Raymond Loewy. Conversion to civilian manufacture was slow, taking more than two years. Located at 349 Ferrie Street East, the pioneer automaker finally began postwar production of passenger cars on August 18, 1948. Model year production amounted to an even 3,000 cars that first year, all of them the modest, thrifty and popular Champions. People had to wait in line for a Studebaker but one of the first ones went to the father of Ontario Lieutenant-Governor Lincoln Alexander, a long-time CNR railroad porter and personal friend of Studebaker Canada president Denis (Gus) Gaskin. Demand was strong for Studebaker products in the heady days. Trucks were added to the mix in February of 1949. Model year totals show 864 trucks and 6,152 cars—all Champions—were built. For the very long 1950 selling season a whopping 15,073 Champions rolled out the doors. The bullet-nosed bodies were extremely well accepted by consumers. Folks bought 2,121 stylish Studebaker trucks that year, too. The passenger car envelope was only mildly facelifted for the next year. Commanders were added to the lines in 1951; a total of 1,953 of the high-priced cars were built along with 11,180 Champions and 1,824 trucks. 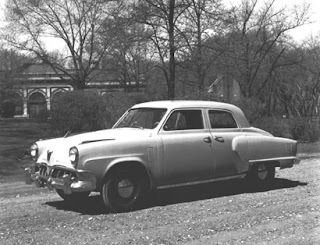 For the 1952 model year—Studebaker’s 100th in the transportation business—a heavily revamped passenger car was offered. It was attractive but not the most inspired design in that year’s market. Totals added up to 9,437 Champions, 1,295 Commanders and 1,021 trucks. That was not a good sign and the 1953 model year didn’t look good either with final tallies of 8,141 of the new Euro-styled Champions and 1,298 Commanders leaving the factory. Truck production was absolutely dismal with only 699 units built. Management was optimistic, blaming the shrunken totals on 70 production days lost because of supplier strikes and the conflict in Korea rather than consumer rejection of the new look or quality control issues. The 1955 Studebaker President rode a 120.5-inch wheelbase and weighed in at 3,080 pounds. In Regal trim it listed for $2,707 f.o.b. Hamilton, Ontario. With 555 workers on payroll, the company geared up for the 1955 season in September of 1954. Studebaker announced it was the style leader with cars “of truly impressive power and superb proportions; each a masterpiece in interior elegance—carrying prestige anywhere in the world.” What that translated to was new “butterknife” trim on the sides and a heavier chrome front end. The Commander was billed as “another triumphant stride forward for Studebaker.” It claimed to be the most impressive looking car in its price field. Under the hood was the 140-horsepower Pace-setter V-8 mill. The 1955 Studebaker Champion was popular with Canadians. Workers happily built gas-sipping Champions, too. The economical Victory Six engine was beefed up by 18 percent. It now delivered 101 horsepower and challenged the Nash Rambler for the title of thriftiest automobile in the nation. Owners were told to be proud of the “stand-out smartness” of a Champion and to be prepared for admiring attention it would draw from every quarter. The beautiful Starlight Coupes were created for Studebaker by industrial designer Raymond Loewy. This 1955 Commander V-8 Regal Starlight Coupe listed for $2,752 f.o.b. Hamilton. 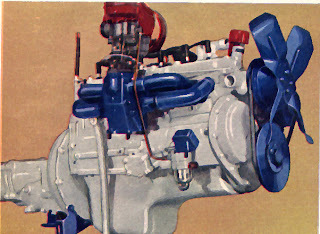 and built by Studebaker engineers generated a thrill-packin' 140 horsepower. The 175-horsepower Wildcat V-8 engine made the big car move along at a fast clip. “You quickly learn to watch your speedometer alertly on the open road,” advertising warned. How true it was! 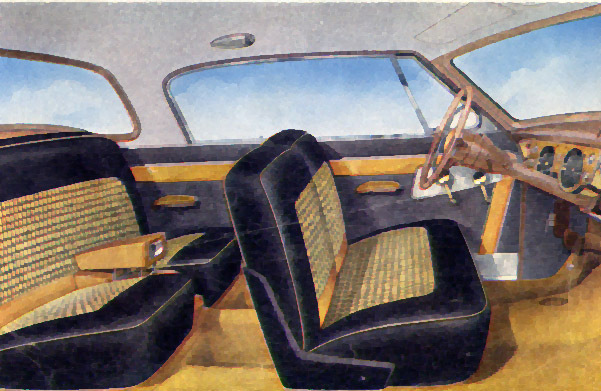 Interior of the 1955 Studebaker President was posh beyond compare. Note the large centre armrest in rear. Interiors of the President models were finished with gold-plated hardware, exquisitely tailored fine nylon fabric—with or without vinyl caps--placed over deep cushions. Instrument boards were padded with a resilient sponge plastic. Low numbers prompted company officials to suspend truck assembly. Haulers were imported from the United States though it was announced that truck production would begin again in March. a 116-.5-inch wheelbase and weighed in at 3,275 pounds. On December 31 of 1954 Studebaker formally merged with old-line automaker Packard in a bid to survive shifting markets and tastes. The new entity was known as Studebaker-Packard of Canada Limited, though all Packards would be imported from the US. 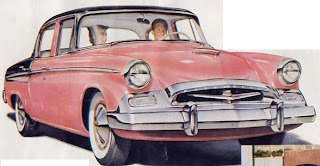 When the lines started up again in Hamilton on January 4, 1955 the Studebaker passenger cars now wore the Ultra-View wraparound windshield. The new glass configuration promised “advanced visibility.” A total of 6,741 cars would carry the wrapped windshield and 1,424 arrived without. 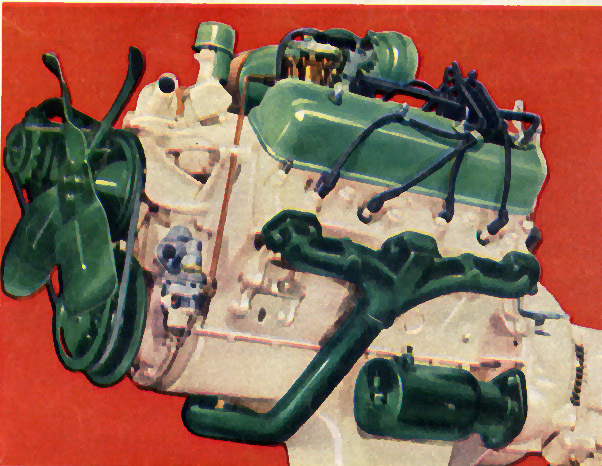 The 1955 Studebaker Victory Six engine offered plenty of pep with its 101 horsepower rating. Options for Studebaker were carefully tailored to the desires of the public. Power Steering and power brakes and turn signals made driving easier. New at midyear were power seats and windows. The Stratoline eight–tube push-button radio or the Starline six-tube radio with manual tuner allowed one to tune in to The Dominion or Trans-Canada networks of the CBC and made driving downright enjoyable. Fog lights and fender skirts were among the popular dress-up items, too. Exterior colours on this season’s palette for Studebakers built in Hamilton were Black, Encino Cream, Saginaw Green, Pima Red, Cascade Green, Tilden Grey, Alpena Blue, Windsor Blue, Shoeshone Red, Rancho Red, Sonara Beige, Sheridan Green, Shasta White and Coral Tone. There were 22 two-tone combinations available and those were no-cost extras for the President State and all hardtop models. Studebaker liked to remind consumers that it had been part of the motor scene in the Dominion since 1911 and the rock-solid employer boasted many father-and-son teams. The multi-generational theme was part of the campaign of pride that kept people coming back to buy more and more Studebakers. The 1955 model year ended for Studebaker Canada with a total of 455 Presidents, 2,272 Commanders and 5,438 Champions being built. It wasn’t the banner year the company hoped for but it would turn out to be better than the upcoming 1956 that was a-waiting in the wings.